In PVsyst software the process of importing Solargis values of irradiation and temperature is very easy and straight forward. 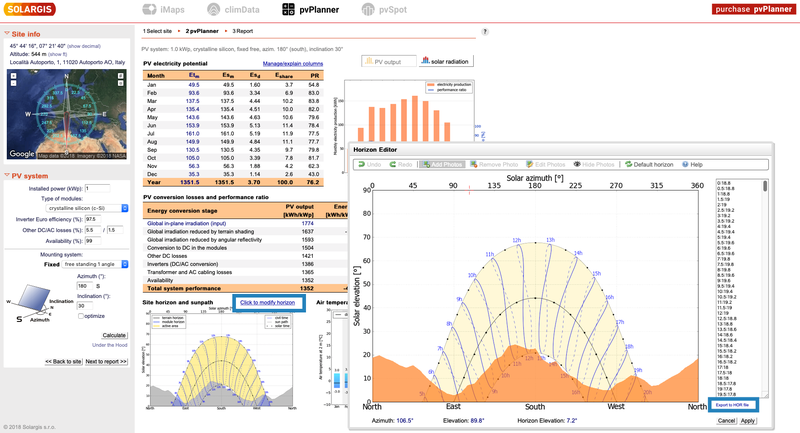 PVsyst simulation engine runs the simulation taking into account global horizontal irradiation, diffuse horizontal irradiation and temperature (and wind speed if available). PVsyst users can proceed in two complementary ways when importing Solargis hourly data. One option is using a Typical Meteorological Year (TMY) file, which summarizes weather conditions in one single year of hourly data. Other option is using a Time series file, from which several separated one year periods for specific years can be created in PVsyst weather database. Go through "Databases" - "Import meteo data" to open a dialog named "Import meteo data from different sources". 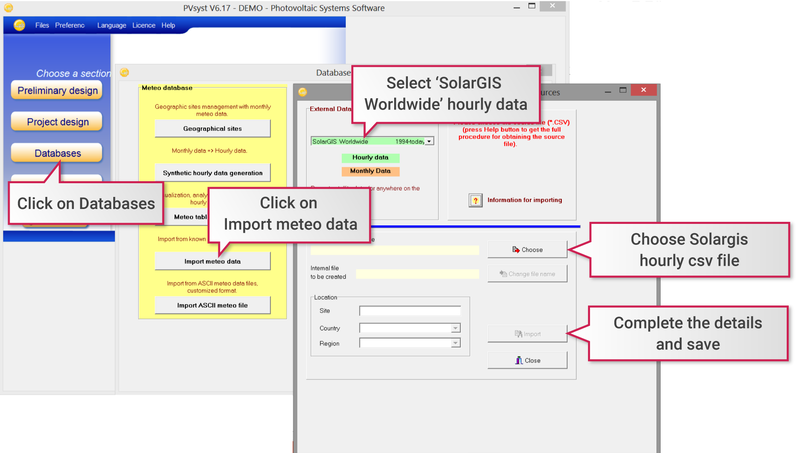 Select external data source "Solargis (Worldwide)" hourly option (green color in drop-down box). Select the Solargis csv file and fill the site and country information required. After clicking on “Import”, PVsyst will create one hourly meteo file (.MET) for one-year period, which can be used when simulating designed systems. Time Zone. PVsyst most recent versions admit data importing in Universal Time Coordinated (UTC) time reference. When this is not the case, in Solargis we are also supporting older versions by providing csv files in Longitudinal Time Zone (LTZ) time reference, which is based on using longitudinal reference of the site as longitude°/15 (rounded value). Please note that in many regions the time zone based on longitudinal reference will deviate from the legal time. Data Time-step. Other time steps like sub-hourly or daily are also admitted in PVsyst. Although importing such files is not so direct, it is possible through "Databases" - "Import ASCII meteo file”. A dialog named "Conversion of ASCII meteo sub-hourly files” will be opened showing other customizable importing options. This option is also suitable when using older data formats which are not supported anymore. Data format. Although recent versions of PVsyst 6 support Solargis csv hourly format, some older versions of PVsyst only accept data in “PVsyst Standard Format”, which can be chosen from the drop-down box when importing data. Solargis also supports this format for such cases when last versions of PVsyst are not available. The Clearness index of the best clear days is very low with respect to the clear day model. Check the values with the "Best clear day Ktcc" graph. In such cases, you need to adjust internal PVsyst limits to make it work (Main window / Preferences / Edit hidden parameters / Category Miscellaneous: Meteo, Simulation, Upper limit for monthly Clearness Index Kt). If needed, you can also adjust the Lower limit for DIF. Period not starting in January. For certain regions, Solargis full time series data file is starting in July 2006 (starting of operations of the satellite over Pacific region). In this case, if a period from January to December is required, Solargis csv file needs to be adjusted by removing the first rows from #54 to #4469 (corresponding to dates from July to December 2006). Before importing the data, the period should be also adjusted manually in rows #19 and #25 accordingly (01/01/2007 instead of 01/07/2006). pvPlanner offers a highly accurate terrain model which can be used also in external applications such as PVsyst. In pvPlanner click on "Click to modify horizon" and then "Export to HOR file". HOR file is directly compatible with PVsyst so you can import it and use Solargis terrain in your PVsyst simulations.